Starting in 1999, Chris Berg designed a number of Internet and Intranet websites. He created sites that have worked well for nineteen years - an infinity on the Internet. Chris combined a love for technology and a love for competition from an early age. At South Side High School, in Rockville Centre, New York, he was captain and MVP of both the football and lacrosse teams, vice president of the Student Government and captain of the math competition team. He won the school's 1990 Laurel Award for outstanding scholastic and leadership activities. At the Massachusetts Institute of Technology, he won the Whiteman Award for robotics design in the famous competition that inspired "Junkyard Wars" and other popular TV shows. He played football and was captain, MVP and an All-New England player on the lacrosse team. After college, Chris worked as a design engineer for Boston Digital and as a quality control engineer for SolidWorks Corp. He continued his studies at Boston University and had just been awarded a graduate study fellowship by the robotics lab at Texas A&M when he was diagnosed with Melanoma. Chris passed away in September 2002, leaving his wife, Christine, sister Bethany, brother Ted and parents Christine and Donald Berg. Since then he has continued to inspire the people who knew him. His friends and coworkers at SolidWorks Corp. have raised thousands of dollars for cancer research in his name by competing in the Pan Massachusetts Challenge bike race. 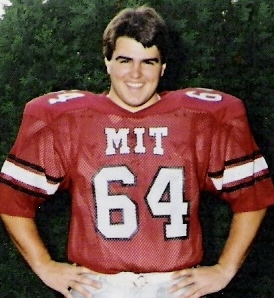 MIT's annual alumni lacrosse game was named The Christopher Berg Memorial Game. Friends and family have established a scholarship fund through South Side High School's football team. And, six newborns have been named in his memory.